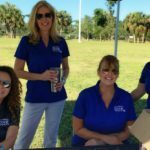 On Saturday, November 18th the staff at Collier Child Care Resources (CCCR) joined other local non-profits to participate in the United Way’s Build-a-Bike Give-Away. 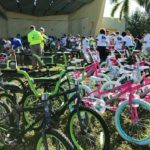 Over 50 bicycles were given away by the organization to families in need, and they even committed to raising funds for a few extra bicycles for children who were tearfully turned away toward the end of the event. Hosted by the United Way, the event took place at the Golden Gate Community Center early Saturday morning. 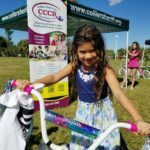 Volunteers spent the day building over 100 total 20-inch Huffy Bikes for both girls and boys, while the Collier County Sheriff’s Office was on-site to provide helmet fittings and bike safety courses, sending each child home with a new helmet and bike lock to ensure their gift could be enjoyed safely. “It was heart-warming to see the smiles on so many children’s faces,” says Michelle Goguen, the Director of Finance for CCCR and a volunteer during the event. Though many people have fond memories of receiving their first bike and long afternoons spent in relative freedom riding up and down the sidewalks, many impoverished families throughout Naples barely have enough money to pay for food, rent and transportation. Expensive luxuries, like a bicycle for their children, often fall by the wayside to make room for more important priorities. Though Naples has the sixth highest per capita income in America, only six miles away in Golden Gate city nearly 66% of residents are living in poverty and are struggling to make ends meet. CCCR tries to bridge this gap by offering partial scholarship assistance to most of their 300 enrollees so working parents can enjoy reliable, high-quality early childhood care and education without a burdening expense. Participation in the bike-giveaway supports the mission of the organization to help families in need with resources and opportunities.